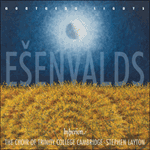 Ešenvalds’ arrangement of Amazing grace was made for Kamēr… in 2004. It is a kind of chorale-variation set—the famous tune is never exactly the same each time it is heard. After its initial statement by a solo soprano the melody becomes gradually more embedded in a rich eight-part texture; instead of the usual ascending semitonal key-shifts, descending modulations serve to ratchet up the intensity and lead to an ecstatic peroration in the home key.